This DC motor testing equipment adopts three-phase bridge SCR regulating speed rectifier and double loop control. Through adjusting output voltage of rectifier to change voltage that load on the two sides of motor armature, the DC motor idling test device can reach the aim of regulating speed. Meanwhile, we can adjust the polarity of excitation current that loads on the two sides of motor excitation winding to change magnetic field direction of motor excitation. Thus the motor testing equipment will realize positive rotation, inversing no-load operation and speed control of motor. Main controller adopts the fourth generation DSP full digital control large panel researched and developed by our research institute. 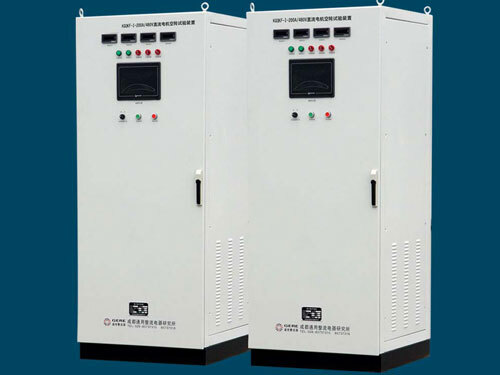 The controlling system of the DC motor idling test device adopts advanced siemens S7-200 PLC computer control system and touch screen operation control system. With high automation, flexible interface, powerful function, humanized design, easy operation and maintenance, this motor testing equipment is widely used. The motor testing device is fully suitable for locomotive depot, motor repair factory that do running in test on railway locomotive traction of Shaoshan vehicle type and Dongfeng vehicle type. DC motor idling test device conforms to the general maintenance specification requirements of idling test of small maintenance and big maintenance of railway locomotive traction motor regulated by ministry of railways. Chengdu General Rectifier Research Institute is a professional manufacturer and supplier of DC motor idling test devices in China. In addition to this DC motor testing equipment, we also produce insulation resistance test device and flexible DC transmission power system overcurrent test device. Our products have been exported to USA, Germany, Australia, Singapore, India, Brazil, Iran, Vietnam, Kazakhstan and Malaysia, etc.